Did you know every year an untold number of personal belongings are damaged while in storage as a result of owner error? Imagine what it feels like not being able to replace a multi-generation family heirloom, and knowing that you were directly responsible for its destruction. 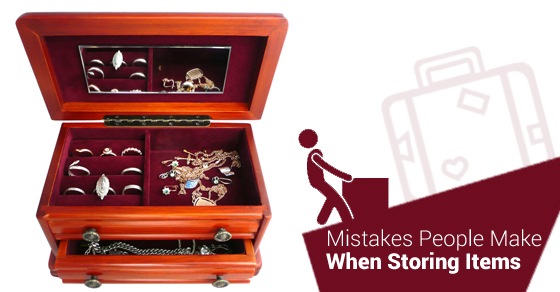 To put it simply, there are right and wrong ways to store household valuables. Given the serious ramifications that can occur, it bears knowing how you should handle yours. Remember, even if you have an insurance policy in place to cover theft or accidental loss/ damage, no amount of money can replace some belongings! Are you Making These Storage Mistakes? The cardinal rule for stacking boxes is to ensure even weight distribution. Always remember to put lighter items on top, as this will prevent damage to surrounding valuables and innocent bystanders in the event the pile shifts. A lot of people do the exact opposite out of sake of convenience. They might not want to remove multiple boxes to access a particular item, but in so doing they risk causing more harm than good. A better solution is to rent a storage unit with adequate space, so you do not have to deal with dangerously tall stacks in the first place! While there is no substitute for hard work, smart work will always reign supreme. Avoid laziness when storing your valuables. Instead of placing boxes, furniture, and other items randomly throughout the storage unit, take the time to use the space as effectively as possible. You probably have more room than you need, even if it does not seem like it. As disgusting as it might sound, thousands of people are guilty of this major storage no-no! Never under any circumstances should you keep food in a short or long-term facility. The only exception is if you are dealing with canned items that have been thoroughly sealed and locked up. The moment rodents and other pests become drawn to your storage unit, it is game over for those precious valuables! When planned and executed properly, you should have no issues storing your possessions. You will save a lot of time, money, and headaches by avoiding these and other common storage mishaps.